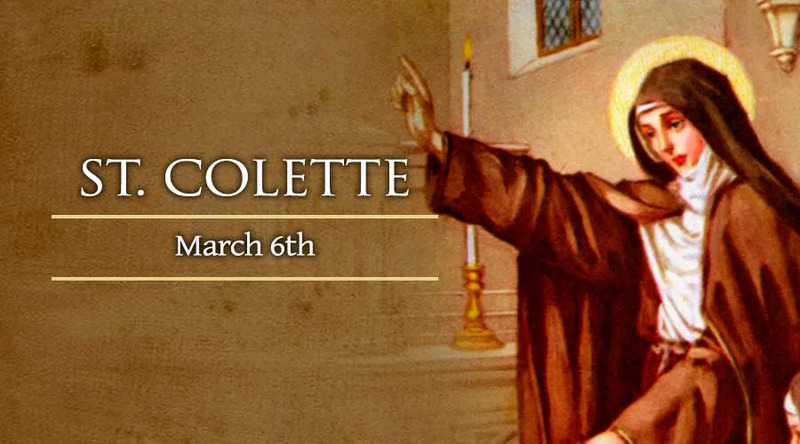 Colette was born January 13, 1381 as the daughter of a carpenter named DeBoilet at Corby Abbey in Picardy, France. Orphaned at seventeen, she distributed her inheritance to the poor. She became a Franciscan tertiary, and lived at Corby as a solitary. She soon became well known for her holiness and spiritual wisdom, but left her cell in 1406 in response to a dream directing her to reform the Poor Clares. She received the Poor Clares habit from Peter de Luna, whom the French recognized as Pope under the name of Benedict XIII, with orders to reform the Order, and appointed her as Superior of all convents she reformed. Despite great opposition, she persisted in her efforts. She founded seventeen convents with the reformed rule, and reformed several older convents as well. She was reknowned for her sanctity, ecstacies, and visions of the Passion, and prophesied her own death in her convent at Ghent, Belgium. A branch of the Poor Clares is still known as the Collettines. Collete was canonized in 1807. Her feast day is March 6th.